Back in the day, working with top quality materials was normal, an everyday affair. There was demand for the best, local supply houses stocked the best, tradespeople used the best. Then came the wave of Big Box Home Centers. Pennies, and soon dollars, were pinched off every job. Available materials became more generic. But in doing our best, doesn’t that start with the best tools and materials? A renovation job was going south. Repiping a bathroom from below, I discover grout or thinset (the sticky mortar in which one sets tiles) followed a copper water supply pipe through its floor penetration. The mortar was attached rock solid to the copper. Tight quarters for polishing copper preparatory to soldering, the proverbial & literal ‘rock and a hard place’. My assistant went at it with his ‘standard quality’ scratch cloth, but halfway materials produce halfway results. Time to break out the good stuff. Into my torch bag I retrieved a length of blue scratch cloth. Waterproof, for what is plumbing if not dealing with water? Linen-backed, giving this 120-J grit scratch cloth long-lasting flexibility. The same cloth I’ve trusted for decades. Mill-Rose. When it’s time to take it all off, I reach for the world leader in abrasive scratch cloth. Copper oxides are but a memory to this durable abrasive cloth. Paint is pulverized. The mortar on our copper? Back into dust. (Yes, I wear a respirator on every job!) The ability to overcome any obstacle, that is where the quality of Mill-Rose shines. Leave nothing to chance. When it’s time to replenish supplies, don’t take what is offered. Ask your supply house for Mill-Rose. 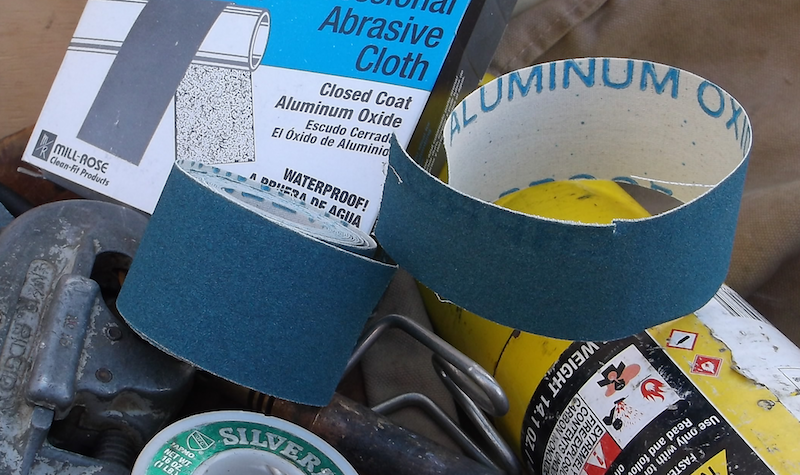 This entry was posted in Product Review and tagged 120-J blue, best quality plumbers scratch cloth, blue scratch cloth, mill-rose, plumbers sand paper.